Your dentist could have recommended using a dental guard because you clench or grind your teeth. Also known a sleep bruxism, the habit has been cited by dental experts as a major cause of worn, broken or cracked teeth. Although teeth grinding mostly occurs at night when sleeping, you might catch yourself doing it during the day. It may, however, take a couple of nights of consistently using your new mouth guard before you can comfortably adapt to sleeping with it and not feeling some pain after using. During the initial days, you might experience some light tooth soreness but this is normal. However, if you continue to hurt for an extended period of time, it could mean something is wrong somewhere. Common reasons why your teeth hurt after wearing a mouth guard include the following. 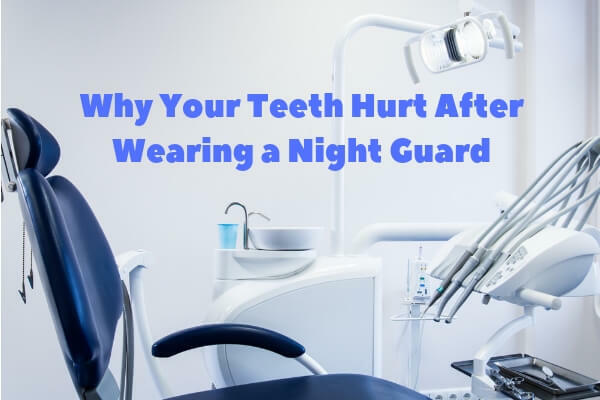 One common reason why you might feel pain after wearing a night guard can be that an inaccurate dental impression was taken by your dentist or it was taken by an inexperienced person. Night guards ordered in a drug store or online might not properly fit your bite. They could be a cause of not just pain but serious dental complications if used for extended periods. This is particularly bad if they are too tight or even too loose. Wearing a mouth guard throughout the night means that you are constantly exerting some light pressure to your jaw muscles. The jaw muscles are not accustomed to having unusual pressure or being stretched for extended periods of time. Because of that, when you wake up in the morning, you might experience sore gums or some pain, which could even last throughout the entire day. The majority of the out-of-the-box mouth guard versions are poorly made. These low-end quality products mean they may not last for long and if you are an aggressive teeth grinder, they could cause serious damage and unnecessary discomfort. The best route is to seek professionally fitted mouth guards from a qualified dentist made with quality materials. Read more about the most common symptoms and remedies for teeth grinding. The important thing is to take any form of discomfort or pain in the mouth seriously if you are using a night guard. That also means replacing your mouth guard if it’s causing pain after wearing it all night or if it’s worn out as it will no longer be giving you optimal protection. You need to get a professionally designed and prescribed mouth guard.